Here's my second block from Sany's pattern, using her diagonal color change directions! 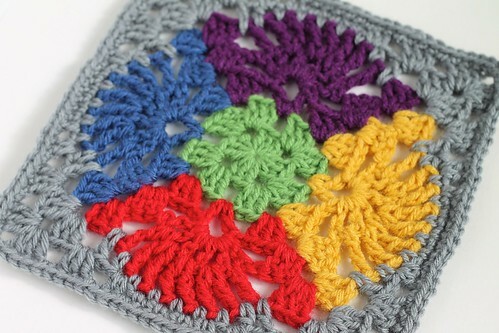 In the corners, you join with one chain and a single crochet, and continue with the same color. I'm not explaining it very well, so you should check out her directions. It's pretty brilliant. So, I'm kind of an L. Frank Baum and Oz fan... And I'm really excited (and nervous) about the new Disney movie Oz The Great and Powerful. 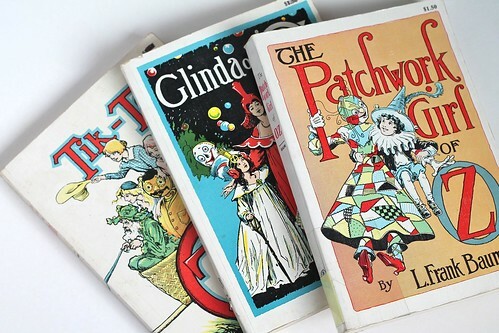 Did you know that there are fourteen books in the Oz series by Baum? (Oh man, my geek is really starting to show! And I'm afraid it's going to get worse.) 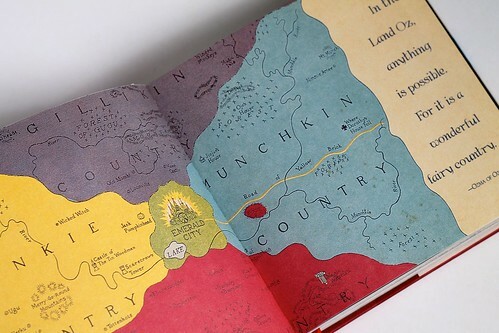 In the books, the land of Oz is made up of four countries, and in the middle where they meet, is the capital, Emerald City. Each country has a favorite color... Munchkin's is blue, Winkie's is yellow, Gillikin's is purple, and Quadling's is red. Now is my crocheted block making sense? I did a quick internet search to find what those colors were again instead of going through my books, and ran across an entire wikipedia page on the Land of Oz. So I made my block based on the colors of the map I found there... Later I pulled out a few of my Oz books to show you, and found I had a map in my All Things Oz book. And I noticed the colors are reversed! Well, apparently East and West are sometimes reversed, and there's an entire little section in that wikipedia entry devoted to theories on why haha!! And I haven't even mentioned the Oz graphic novels (I have a couple by Eric Shanower), a bizarro fiction book (The Emerald Burrito of Oz), or an Oz/Wonderland crossover comic book (Oz/Wonderland Chronicles Book 1)... Oh man, I've said far too much! My geek flag is a flyin'! Oh well, you've probably already figured out I was a big book nerd from my other book inspired crocheted blocks (like Wool, Molly Fyde, Dr. Seuss, Under Wildwood, The Mark of Athena, Tantra Song, and Alyss Heart). So, bringing this back to where I started, now you may understand why I'm both excited and nervous about this new Disney movie! I don't want to be disappointed! 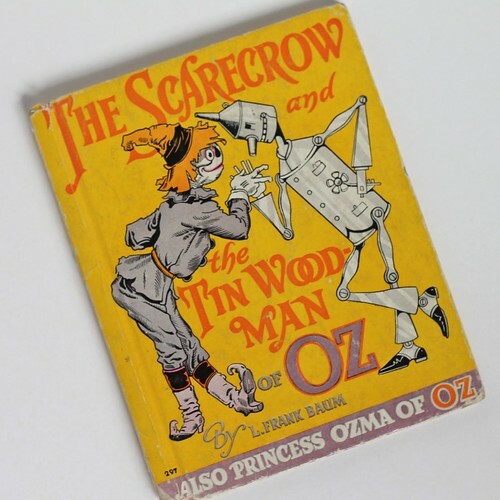 However, I think it's good that the original Wizard of Oz movie, which you are most likely familiar with, is still owned by MGM, which means for this new movie Disney will have to rely more heavily on the original books by Baum since they are in the public domain! That's probably enough Oz talk for today... Have you guys read any of the Oz books? Do you like movie and book adaptations of older books and fairy tales? Now we have the Land of Oz square according to the colours of the map in the book you show here! Well done! I could be wrong, but I think you might be an Oz fan! I hope it works over there! Otherwise, just look on youtube and you'll find it. Wow Kate, this is a brilliant post. i love it when people are passionate about things and I'm so impressed by your knowledge and book collection (silver shoes eh?) We have the DVD of the original film and enjoy watching it as a family but I've never read the book - want to now though! Thanks for showing your geeky side, it makes me happy you've shared this, and of course I love your crochet block! yippeeeeee for new ideas for reads!!! My DD had several of the Oz books too. I did know about the silver shoes (from DD). I was in the Wizard of Oz play in high school and my DD was in it in middle school. Did you know Buddy Epsen was the original Tinman, but had a bad reaction to the makeup and had to be replaced? We also have a Wizard of Oz cookbook. Love the block...and the story behind it. 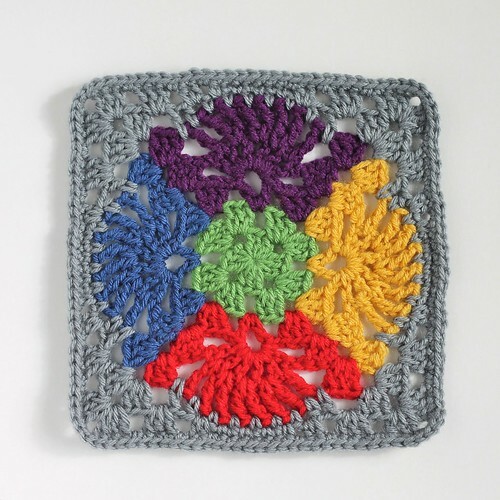 Your OZ square is gorgeous! I'm just reading "Wicked" and am fascinated by all of the Lands of Oz and the back-story. A friend of mine saw "Oz the Great and Powerful." He's a movie reviewer. Here are a few of his comments: " It's odd and James Franco is a mixed bag but it's so visually stunning that I was transfixed throughout. They made such a point of saying it's not based on the MGM film (for legal reasons) but only the books and yet there are SO many nods to the 1939 movie that don't exist in the books. Loved the Kansas stuff at the beginning and enjoyed the three witches. Nice to see Rachel Weisz having a little fun for a change." Thank you Ellen! And thanks so much for sharing your friends review! I read an article that seemed to indicate they were trying to get as close as they could to the MGM film without getting into legal trouble... But I suppose there are probably more fans of that film out there than fans of his books. I'm relieved that it should at least be worth seeing for the visuals!! I own "Wicked" and can't believe I haven't read it yet haha!! I really enjoyed your post! I read many of the Oz books as a child and they were always among my favorites. I especially liked The Marvelous Land of Oz and Ozma of Oz. I am a teacher and always read some of the Oz books to my class each year. This year I have read 3 and the students are (this very week!!!) spending their recesses creating a puppet play about Princess Langwidere and all of her heads!! The books are fun to read as an adult. There is a lot of humor that I missed as a child. Your crochet square is terrific. What a wonderful idea! Thanks!! I think it's fantastic you read the books to your classes, and I love that the kids are making a puppet play! So creative!! I think the staying power of these books that were written so long ago is just amazing. Thank you for sharing this and I wish I could see your students' play!! (Sorry it took so long to respond!) You're very welcome, and I'd love to hear more as you work on the costumes!! Sounds fantastic! (All except for the green face paint bit of course, poor girl!) If you want, email me (signedwithanowl@gmail.com) your email and I can probably put some book info together for you!